NOTE - The following data is registered at the United States Copyright Office and is the property of Richard P. Sevier (dicksevier@gmail.com). It is intended for informational use only and may not be reproduced by ANY means whatsoever without written permission from the author. This article replaces and updates an older, less complete article entitled Earliest Madison Parish Landowners. This article provides a list of Madison Parish’s earliest (original) landowners beginning at the time when Louisiana became a sovereign state. These public lands were sold by the United States General Land Office (GLO), and land “patents” were issued to the purchasers, who were called “patentees.” In addition to the patentee list of original property owners, detailed Township Maps are provided that indicate the exact location of each property. An Index Map of the parish helps locate each township. In 1812, the year Louisiana became a state, the GLO was created by Congress to manage all public lands. Some patentees bought their land for cash; others homesteaded a claim or were “warranted” a claim based on their service during the Revolutionary War. To purchase land the private claimant went to the land office in the land district where the parcel was located, filled out "entry" papers to select the parcel and paid his money. The GLO then sent the paperwork to their office in Washington, which double-checked the accuracy of the claim, its availability, and the form of payment. If everything was in order the GLO issued a patent showing the owner’s right and title to the land. Occasionally, for various reasons, the patents were cancelled. Most of the cancelled patents in Madison Parish seem to have been cancelled on a technicality since many of them were later repurchased by the same person or persons. The GLO is the source of all patentee data in this article. · Patentee Name. In the GLO roster many names were spelled several different ways. For the purposes of the Patentee List the spellings of some names were changed such that each name is always spelled the same way thereby causing like names to sort together. Nicholson Barnes – 3,318 acres. Builder of the house at Crescent Plantation, near Tallulah, one of the two or three houses in the parish that General Grant did not destroy. Judah P. Benjamin – 80 acres. US Senator from Louisiana; Secretary of State of the Confederacy. Jefferson Davis – 320 acres. President of the Confederacy. Joseph E. Davis – 1,560 acres. Brother and benefactor of Jefferson Davis; owner of Hurricane Plantation, Warren County, MS.
Nathaniel Hoggatt – 3,464 acres. From Natchez, MS. One of the largest early landowners in Madison Parish. Levin R. Marshall – 9,535 acres. From Natchez, MS. Largest landowner in Madison Parish. Owner of Richmond and Lansdowne Plantations in Natchez. Namesake for city of Marshall, Texas. Financier of the Texas Rebellion. One of only 35 millionaires in the US at the time. John Millikin – 2,403 acres. Founder of Milliken’s Bend. One of Madison’s earliest landowners, and grandfather of John Milliken Parker (note spelling of Milliken), governor of Louisiana from 1920-1924. Honoré P. Morancy – 2,763 acres. Responsible for the creation of Carroll Parish in 1832, named for his friend Charles Carroll – the only Catholic signer of the Declaration of Independence. Haller Nutt – 404 acres (Conway R. Nutt had an additional 961 acres) Builder of Longwood, the well-known unfinished octagonal antebellum home in Natchez, MS.
Hypolite Pargoud – 2,721 acres. Large landowner from Monroe, LA. John Perkins – 776 acres (several thousand more in Tensas Parish) Owner of the huge Somerset Plantation. At one time he owned “The Briars” the antebellum home in Natchez, MS where Jefferson Davis married his wife Varina. Robert M. & Thomas B. Scott – 1,440 acres. Owners of Scotland Plantation from which much of Tallulah was later derived. Thomas B. Scott became Madison Parish’s first sheriff in 1838 and served until 1844. Robert J. Walker – 4,048 acres. U.S. Senator from Adams County, Mississippi. U.S. Secretary of the Treasury under Polk. Namesake for Walker, County, Texas until he supported the Union during the Civil War. · Patentee Residence. This is the residence of the patentee at the time he bought the land. This can become very confusing in Madison Parish because the GLO started selling land long before Madison became a parish. An excellent example of this is John Millikin who, when he bought land in 1826, was listed as living in Ouachita Parish. When he bought land in 1837 he was living in Carroll Parish, and when he bought in 1846 he was living in Madison Parish. Of course his actual residence never changed. Many Madison Parish patentees are shown as living in Concordia Parish when they bought their land because at one time most of what later became central and southern Madison Parish was located in Concordia. Patentee residences were not listed after about 1900. · No. of Owners. Many people bought land in partnership with others, some for speculation. So this just shows how many people had ownership in the patent in question. 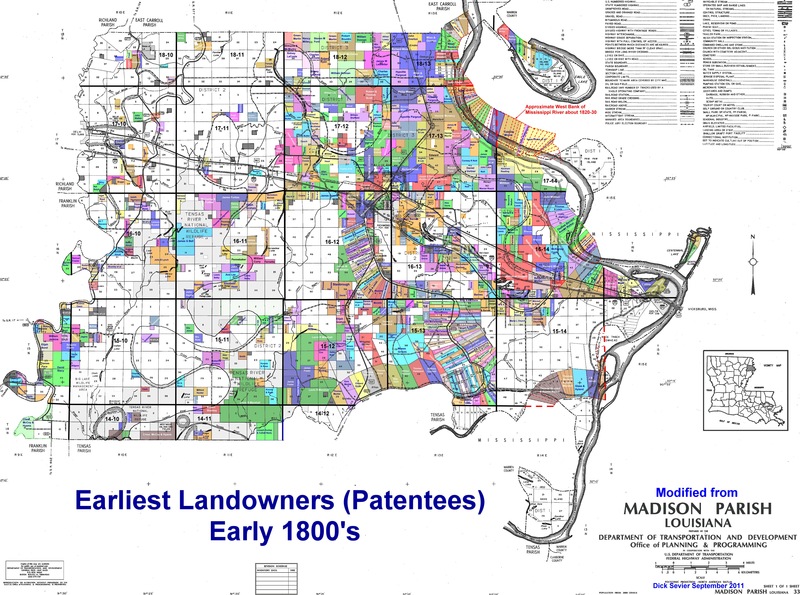 In a few instances, all after 1900, as many as 30-50 individuals were awarded patents together, and in one unexplained case 99 patentees held ownership in only 3.5 acres. · Issue Date. The official date that the patentee received title to his land. · No. of Acres. The total amount of acreage in each patent. Some patents contained many tracts, each of which had a unique legal description. · No. of tracts. 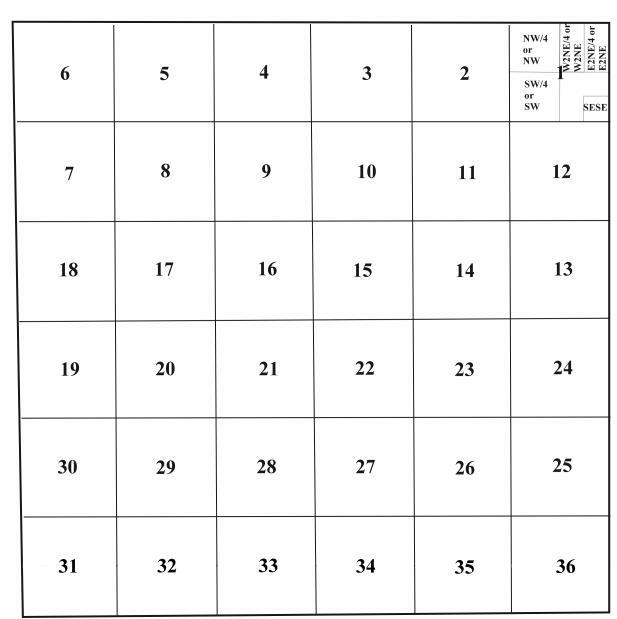 The number of tracts in each patent. · NET AC PER TRACT. The net acreage each person received on each tract assuming the owner’s percentages were equal. It was calculated by dividing the number of acres in the patent by the number of owners and then dividing that by the number of tracts in the patent. · TOTAL ACREAGE. The total amount of acreage each person bought from the GLO. This is not necessarily the total amount of acreage they owned, because many of the landowners added to their holdings later. The ten largest owners of GLO acreage in Madison Parish are shown below. · ALIQUOT or PART. 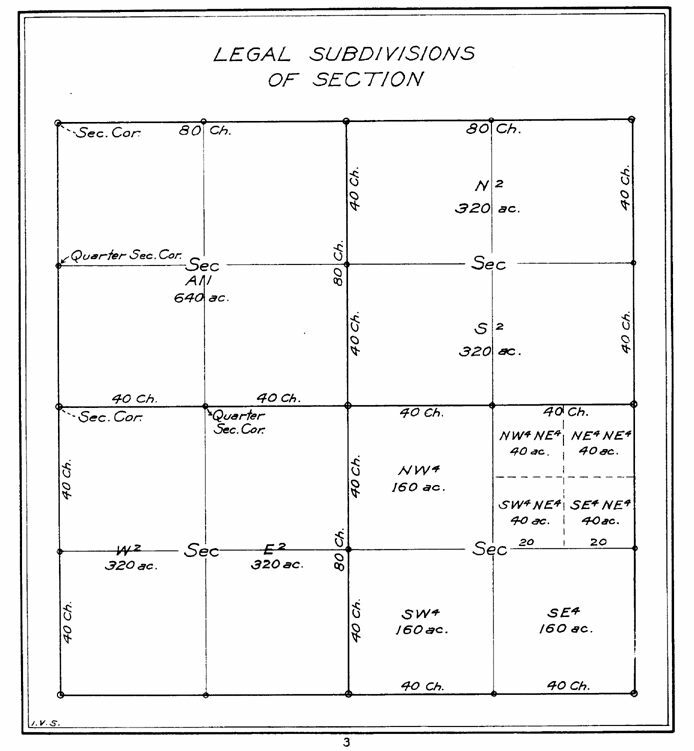 Lot number or legal description of tract – e.g. SENE (SE¼ of the NE¼) or 1. · SECTION. Section containing tract – e.g. 15. · TWP. Township where section is located – e.g. 16N*. · RGE. Range where section is located – e.g. 14E*. · PATENTEE NAME. Repeat of Name for clarity. The Patentee List may be accessed by clicking surnames starting with: A-B, C-D, E-F-G, H-I, J-K-L, M, N-O-P-Q-R, S-T-U, V-W-X-Y-Z. The maps used in this report were made from the original hand-drawn surveys prepared in the early to middle 1800’s. Some are fairly crude and therefore are not of very high quality. Some came from the Louisiana Secretary of State’s office and some from U. S. General Land Office. In a number of instances the survey map data was very “busy”, making the landowner information extremely hard to read. Because of this the information on the survey maps is presented such that the background data has been subdued relative to the property line and landowner information. 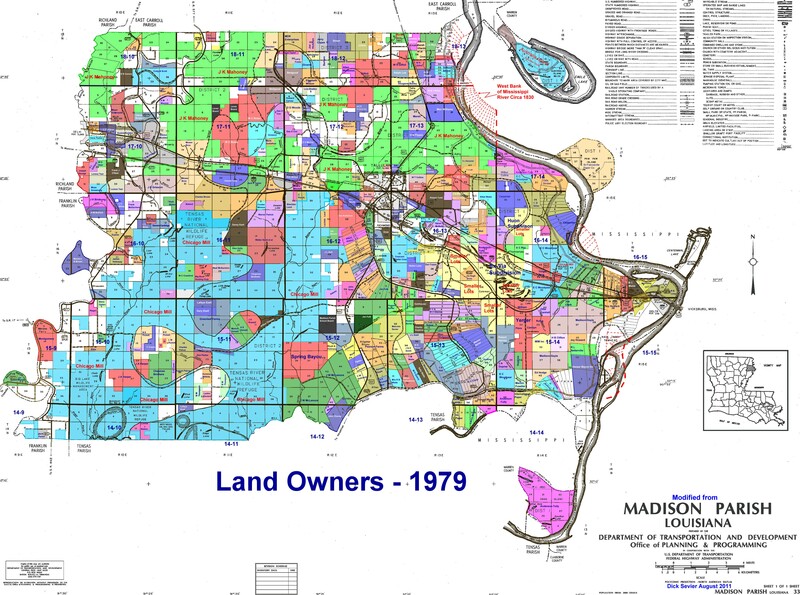 This allows the patentee names, property lines and date of acquisition to stand out and be more easily read, especially since the landowners are color-coded. In spite of this some of the landowner information may still be hard to decipher or the background information may be faint. In this case reference should be made to the Patentee List which will always have the correct names, dates and locations. Any land not showing a patentee was not purchased during the initial GLO offering period. Some of the post-1900 dates are probably the result of corrections made after the original sale. A regular township (see below right) is six miles square and consists of thirty-six regular sections, each a mile square and each containing 640 acres. Townships are measured north or south of a point of origin along a central meridian (in this case the Louisiana Meridian) and ranges are measured east or west from the point of origin. For example Township 15 North (T15N or just 15N) - Range 10 East (R10E or 10E) is located approximately 90 miles north and 60 miles east of the point of origin. As mentioned above each regular section contains 640 acres; a quarter section (e.g. NW/4 or NW), 160 acres and a quarter quarter section (e.g. SE/4 SE/4 or SE SE), 40 acres. For a more detailed see the regular section below left*. Acreage is described with the smaller unit given first, thus SW SE is the SW quarter of the SE quarter, not the SE quarter of the SW quarter as is sometimes mistakenly believed. Starting at the northeast corner of the township regular sections are numbered 1-6 from left to right, then down to 7 and left to right across to 12, then down to 13, continuing in the same fashion to 36. In Madison Parish, due to its many bayous and its proximity to the Mississippi River, there are many irregular sections which are usually long and rectangular in shape and contain varying amounts of acreage. Irregular sections were surveyed along and perpendicular to streams and rivers, so that more landowners would have access to the rich, fertile natural levees that parallel the streams. Natural levees are caused by seasonal flooding which deposits the coarser, sandy material nearer the stream. Sediment deposited further from the stream is usually increasingly finer and forms “buckshot” or “gumbo” soils, typical of a backswamp environment. It will immediately be noted that most of the lands purchased in the early GLO sales were concentrated in the eastern portion of the parish near the Mississippi River and the nearby bayous such as Brushy, Roundaway and Walnut. Except for lands along Bayou Mason, buyers stayed away from the swampy western portion of the parish. In addition to sections the maps also show some “private” lands that were not part of the GLO sale or that were part of a French or Spanish Land Grant. The only definite Spanish land grants in Madison Parish appear to be portions of the Juan Mansol and Miguel De Soto grants in the extreme northwestern part of the parish. For ease in locating the townships, an index map** of Madison Parish was prepared that indicates where each township is located relative to the rest of the parish. 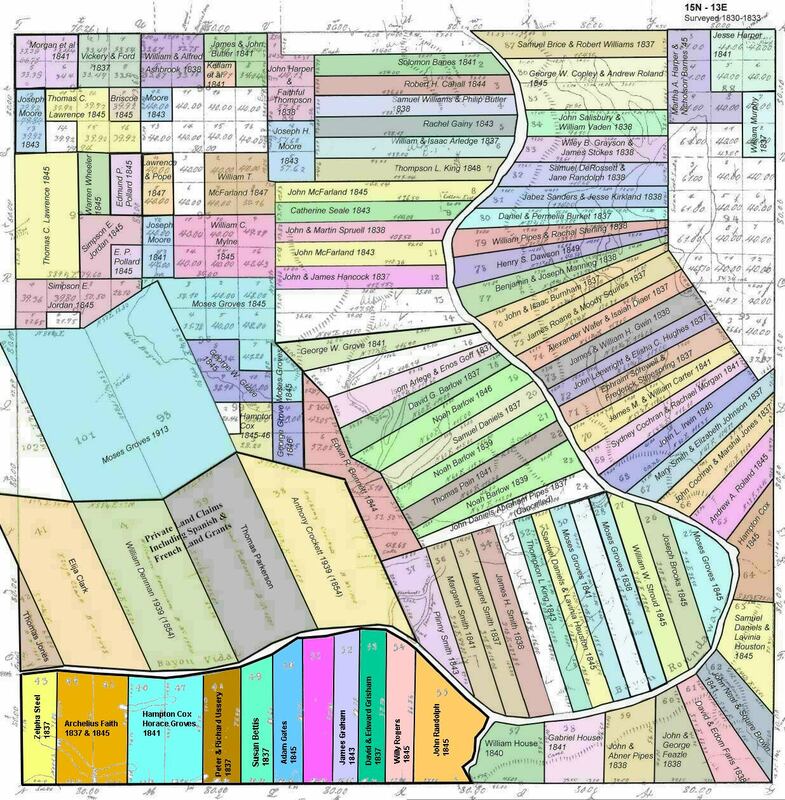 Click on the individual townships for a detailed plat showing patentee names and their color-coded acreage. For example if you wanted to see Township (T) 15N – Range (R) 13E, click on 15N-13E. If necessary, click again to enlarge the area. These maps are organized numerically from west to east by township and range starting on the south with T14N-R9E through T14N-R14E, thence up to T15N -9E and continuing in the same fashion to end at T18N-R14E. Since these maps cover portions of four parishes and/or counties, Madison Parish’s boundaries are shown with a heavy dashed line. 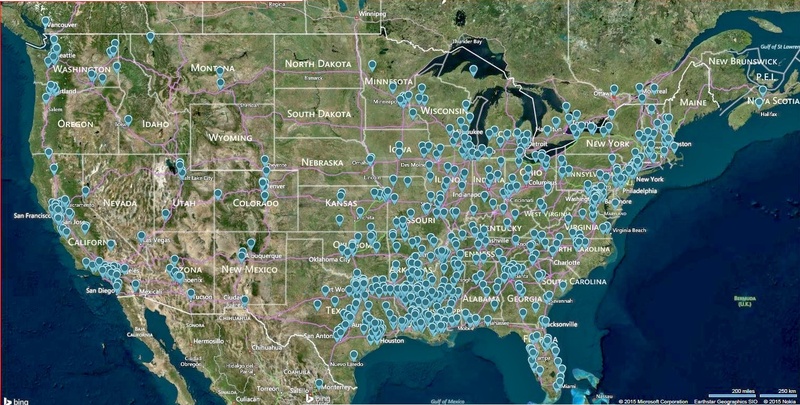 Patentee names and acquisition dates are shown and property boundaries are indicated by heavier lines than survey lines and may cross survey lines, especially on larger properties. As mentioned earlier, patentee acreage is color-coded for ease in viewing the total properties of an individual patentee. Only a few patentees outside of Madison Parish are listed, and those were probably in Madison when the property was bought from the GLO. 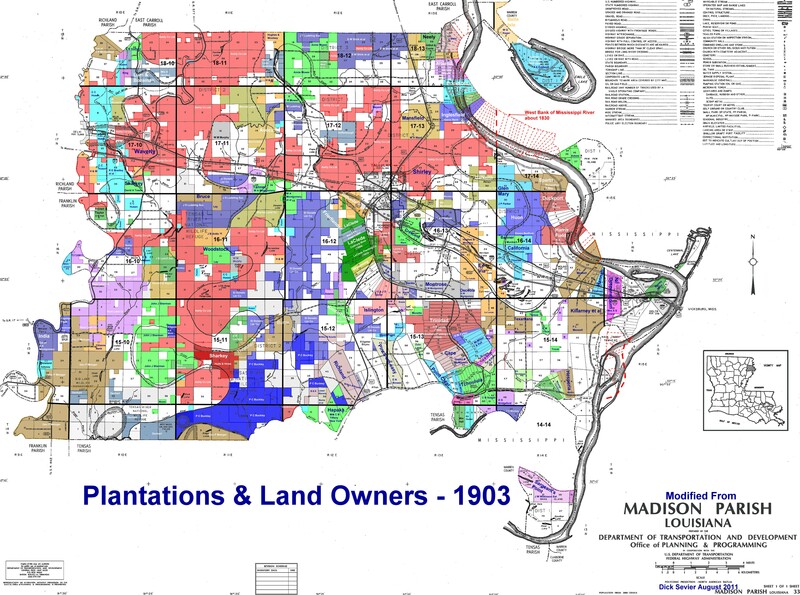 Additional maps showing Plantations and Land Ownership for the years 1875, 1903, 1943 and 1979 may be viewed by clicking on the desired date. The 1903 map was made primarily to show the vast holdings (shown in red) of the 70,000 acre Ashly Co. Ltd of Dundee, Scotland. 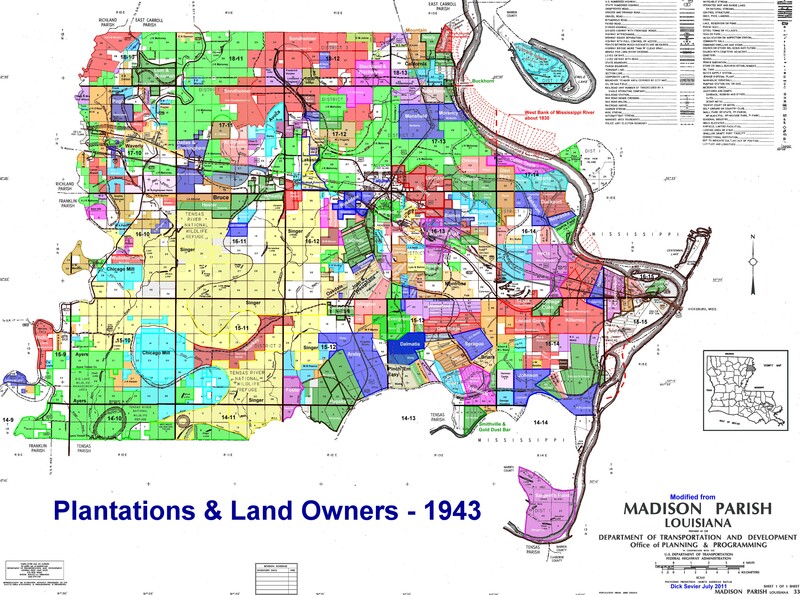 Unfortunately, due to the many land description mistakes and omissions in the 1903 tax rolls, some property locations may be totally unreliable. An early-1800’s Parish-wide Patentee Map is also available, but is not nearly as detailed as the Township Maps. 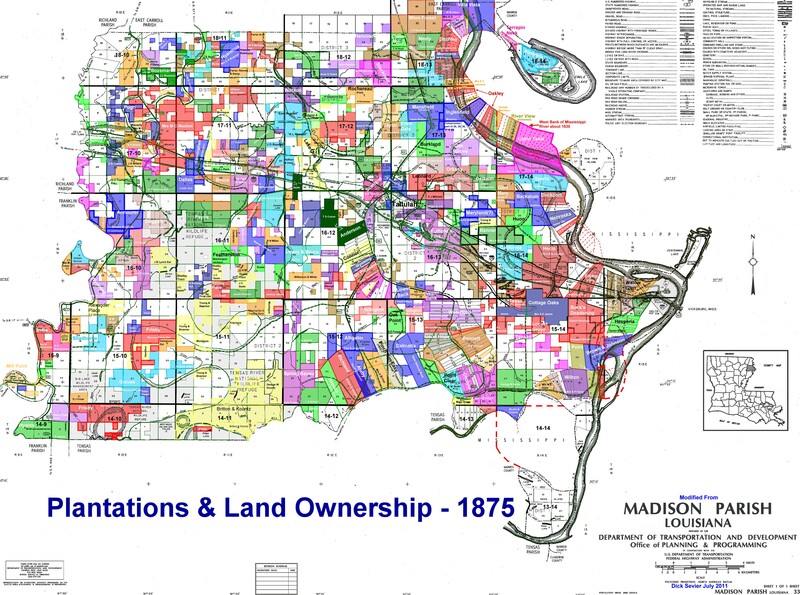 Who is viewing the Madison Parish Patentee Maps? The following two maps show the locations of those who have been interested enough to view early Madison Parish land and landowner data during the 5-year period 2010 to 2014. 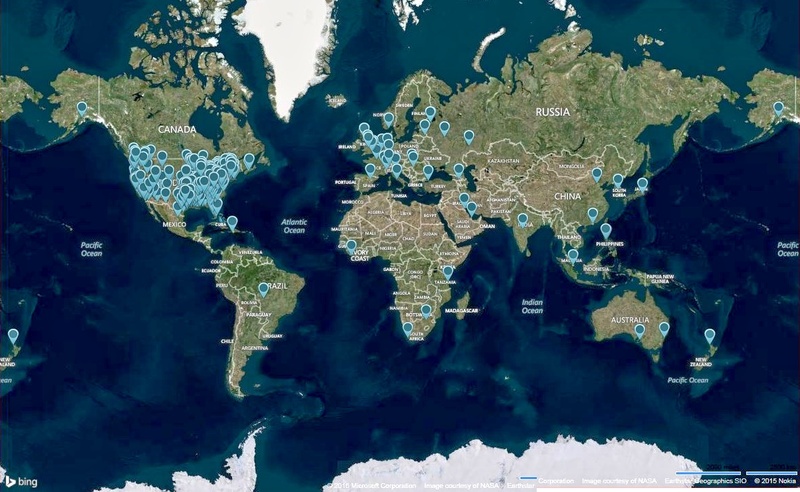 It is interesting to note that people from all over the world have accessed these maps. The first map is a detail of the United States, while the second map shows the entire world.